The XL2 Acoustic Analyzer with the STIPA Option installed offers Speech Intelligibility (STIPA) measurements according to the latest IEC standard for verifying speech intelligibility of voice evacuation systems. New XL2 features, like averaging multiple STIPA results and ambient noise correction further increase measurement efficiency. This allows acoustic consultants and installers to emulate crowded conditions while measuring STIPA onsite in an empty room, and immediately see the effect that the crowd noise has on the STI values. The XL2 firmware Version 2.50 measures STIPA according to the IEC 60268-16 (2011, edition 4.0) standard for verifying speech intelligibility of voice evacuation systems. IEC editions 2.0 (1998) and 3.0 (2003) are also supported. Both STI (Speech Transmission Index) and CIS (Common Intelligibility Scale) values are provided. First measure the typical or worst case ambient noise during day time. Then later when the venue is empty (at night for example) play the STIPA test signal and measure the speech intelligibility. The XL2 Analyzer corrects the STIPA result automatically with the ambient noise that was measured earlier and provides speech intelligibility values that can be expected with crowds present. The PA system can then be optimized for better speech intelligibility as required. In this manner the XL2 Analyzer provides speech intelligibility values at realistic emergency conditions. This is important, as voice evacuation systems with good speech intelligibility may help to save lives. The standard IEC60268-16 recommends taking the average of three or more subsequent measurements at the same location. Multiple measurements increase accuracy and the reliability of the readings. The XL2 Analyzer offers such averaging of STIPA results, calculating both the arithmetic mean value and the statistical deviation. Download the latest XL2 firmware for free at the XL2 Support website. Find out what you need here. 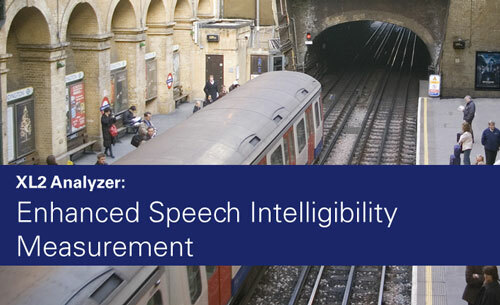 Read more about speech intelligibility in this application note.